Do you need to move files between cloud storage services? Maybe move files between Dropbox and Box? Or do you need to move files from Google Drive to Microsoft One Drive? Or to/from any of the other many storage services that CloudFuze supports? With the latest release, the CloudFuze Webapp 2.0 now offer the ability to move files between cloud services. 1) Have you changed storage services such that you now need to migrate files from one cloud storage service to another? 2) Do you have files in multiple cloud storage services that you sometimes need to move around because you work with different projects or contacts in different places? 3) Do you manage your files in a multi-cloud storage environment and need to move files to stay under your allowed storage limits? 4) Are you just sick of having to go through the arduous process of logging into a cloud service, downloading or emailing a file, logging into another service and then uploading the file just to move files from one place to another? Regardless of your specific use case, CloudFuze offers multi-cloud storage management from a single, universal platform.  CloudFuze offers this across all of your devices for a single monthly cost. And now CloudFuze offers simple, single screen ability to move or migrate files from one cloud storage service to another. You can see the steps in this process below, and/or if you are not already a CloudFuze customer, you can sign up for a free 30-day trial HERE. Step 1: Log in and add storage clouds/services if you have not already then start “Move” . 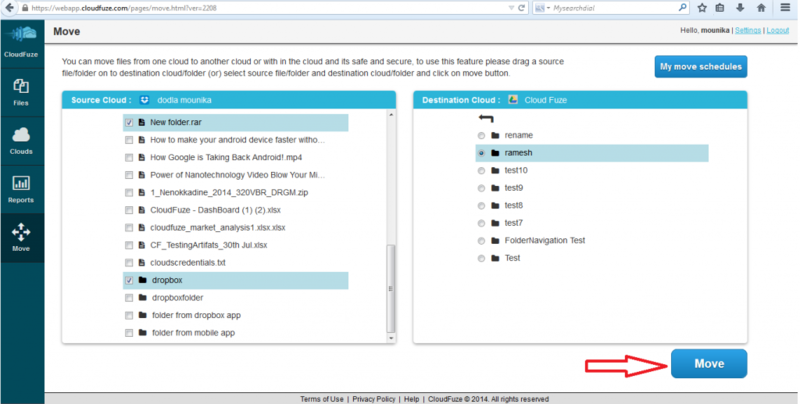 Step 2: Select “Source Cloud” . You will then be taken to a page where you can manage all of the files in the different storage services that you have added to CloudFuze. On the left is the “Source Cloud” where you can select a storage service to move files from. On the right is the “Destination Cloud” where you can select a storage service to move files to. (See the picture below.) Select the “Source Cloud” from which you wish to move files. Step 3: Select files or folders . 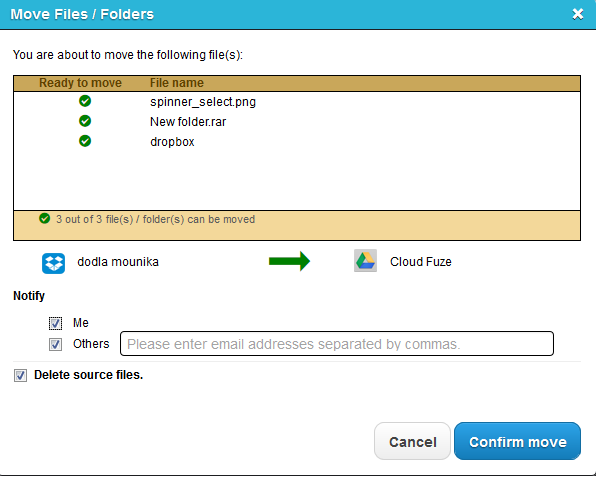 Next, choose the individual files or folders from within the “Source Cloud” that you wish to move. Finally, select the “Destination Cloud” and folder location to which you would like to move that file, and then click “Move” in the bottom right corner of the screen. You will then be presented with a confirmation screen with details of the transaction including files to be moved and the “Source” and “Destination” storage services. Below the transaction details, you can have transaction completion notifications sent to yourself and also others. You also can choose to keep the source files on the original storage service. (If so, you will now have copies of the files in both storage services.) After checking the transaction for accuracy, click “Confirm Move” in the bottom right corner of the screen to complete the transaction. You can see the status on move transactions that are scheduled for your account. If you have selected notify option you will receive an email once after the migration is completed.